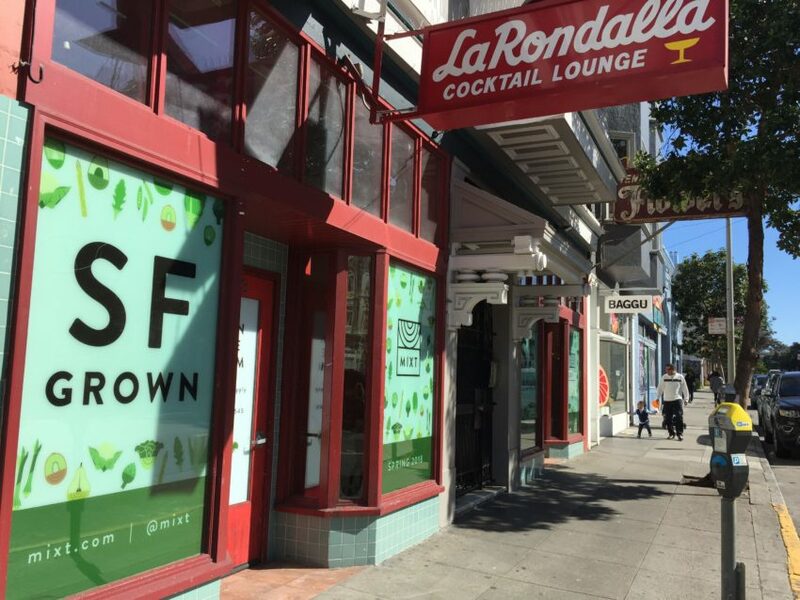 Mixt Greens, a salad chain with eight other locations in San Francisco — and two in Los Angeles — is moving into La Rondalla’s former space at the corner of 20th and Valencia streets in May. The location, with its international-orange paint job and iconic sign, has been vacant since the summer of 2016, when its owners quietly closed the Mexican cantina. Before La Rondalla re-opened in 2014, the space had been empty for some seven years after being shut down by the city. It had been on Valencia since 1951. Now, instead of mariachis, stiff margaritas and failed health inspections, the space will be the site of an upscale salad joint with four different legume options and eight different kinds of vinaigrettes. Not to mention a “salad lounge” where one can imbibe beer, wine and kale mimosas. “As San Francisco-grown company, we’ve always wanted to have a place in the Mission,” Mixt Green co-founder Leslie Silverglide told Mission Local. The company chose the location largely because of its proximity to the Dolores Park, Silverglide said. She said the restaurant plans to keep the La Rondalla sign, but does plan to change the red-orange color scheme. “It will be getting a bit of facelift,” she said. This will be Mixt Greens’ 11th location, putting it just shy of the city’s definition of “formula retail,” which would require special approval from the city. The restaurant chain does, however, have two other locations called Mixt Rovers, trucks that park at locations and dole out pre-ordered salads. These are not considered locations, as they are not “permanent” and “physical,” according to Gina Simi, a spokeswoman for the Planning Department. Silverglide, likewise, said that because no food is prepared at the sites, and they are “purely delivery spots,” they do not count as “locations.” “We’re not formula retail,” she said. Merchants on Valencia are just relieved something is going into the space. “It’s really helpful to have to have something that’s going to draw foot traffic,” said Jefferson McCarley, a spokesman for the Valencia Corridor Merchants Association. He noted that the there’s some 70 feet of “deadspace” around the V20 apartment building across 20th Street, which he says kills foot traffic in the area. Benny Gold, the owner of clothing store Benny Gold, located a few doors down, said he would rather the space be filled by a more independent company. Another nail in the coffin of Valencia.